Note: Since this article was published, ACOG released new VBAC guidelines in 2017 and 2018. Both maintain that LAC (labor after cesarean) induction remains an option. Many of the comments left at the Forced Cesarean story questioned the safety of LAC induction. Many people believe that is it excessively dangerous and that planned VBACs should never been induced or augmented. This is simply not true. Spontaneous labor is always preferable to induced or augmented labor. But there are situations that can necessitate the immediate birth of a baby. If a vaginal delivery is still an option, then birthing parents should have a choice: induction/ augmentation or repeat cesarean. Of course, reviewing the risks and benefits of available options, including doing nothing, is essential. Some might be more comfortable with a cesarean whereas others might want to give a slow Pitocin and/or Foley catheter induction a go. Induction of labor for maternal or fetal indications remains an option in women undergoing TOLAC … However, the potential increased risk of uterine rupture associated with any induction, and the potential decreased possibility of achieving VBAC, should be discussed… Misoprostol should not be used for third trimester cervical ripening or labor induction in patients who have had a cesarean delivery or major uterine surgery. While LAC induction does carry additional risks, the birthing parent still has the right to choose induction. As with all medical decisions, the provider is there to advise the parent and make a recommendation. The parent takes that information and makes an informed decision. Then, ideally, the provider supports that informed decision. Respect for patient autonomy supports the concept that patients should be allowed to accept increased levels of risk, however, patients should be clearly informed of such potential increase in risk and management alternatives. 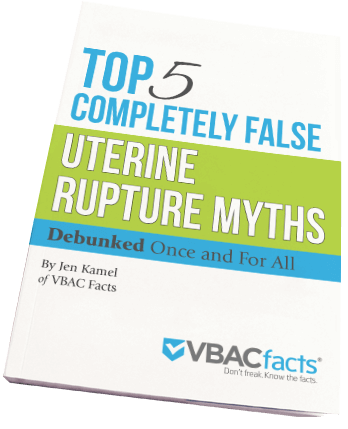 The elevated risk of uterine rupture associated with LAC induction has been documented in several studies. Landon (2004) reported a 0.4% rate of uterine rupture among those laboring spontaneously after one prior low transverse cesarean. That increased 2.5 times for induced labors (1.0%) and 2.25 times for augmented labors (0.9%). This increased risk was highly significant (P<0.001). Taking all labor types into consideration, Landon reported a 0.7% rate of uterine rupture among those laboring after a cesarean with an additional 0.7% experiencing a uterine dehiscence. 2.24% for prostaglandin induced labor. While some argue that induction is overused in America, which is tied to unnecessary emergency cesareans, it’s important not to cloud inductions that fall outside of current guidelines versus medically indicated inductions. A low-dose Pitocin and/or foley catheter induction “remains an option” in women laboring after a cesarean per ACOG and I think that is a good thing. I’m 41+6 gestation and I am booked to go in tomorrow morning for IOL using syntocinon. Other than post dates the reason for this is diffused calcification of placenta, low liquor, ruptured membranes, baby is weighting 4k on scan, and 1 previous c section. In the 1st instance I wanted a homebirth but now want to be safe and am going in. However I would still like to aim for a VBAC but would ideally like to avoid risky interventions. What is the risk of syntocinon over waiting (risk of infection/rupture/placental compromise)? Urgent information please. I am not a medical professional and so I cannot tell you what your risks of waiting are versus getting induced tomorrow. I recommend asking your care provider tomorrow that question so you can make an informed decision tomorrow that you can feel good about. I can tell you that ACOG says that the risk of stillbirth and other complications do increase after 42 weeks. The higher your Bishop’s score is tomorrow (google it), the more likely your induction will result in a vaginal birth. I’ll be thinking of you and hoping everything goes smoothly! Hello, I’m a gravida 4 para 3, currently pregnant, mom. My first 2 (girls) were successful vaginal births induced (with cytotec initially, then augmented with amniotomy and/or pit) at 39 weeks due to non-symptomatic gestational hypertension. My 3rd (my son) was also induced (cytotec) at 38 weeks due to symptomatic (headaches, although non-preeclamptic) gestational hypertension. My son developed non reassuring fetal heart tones and I had an emergency c section with general anesthesia. Given my history of GH, although not a guarantee, I think it’s reasonable to anticipate it with this pregnancy, making induction likely (if I were to opt for TOLAC). My concern though, is that this is a twin gestation, and I cant’ find any data on both Twins AND induction due to GH (likely because there isn’t any, lol). Any guidance would be appreciated. I haven’t seen any research looking at twin induction due to GH, it might be out there though. Your best bet is to get a couple opinions from VBAC friendly obstetricians in your area. Thanks for this. I’ve been induced twice now, both for medically indicated reasons (I carried my first to 42 weeks and my second to 43, and her heart rate kept dropping during the NSTs). At 43 weeks with my second, after 30 hours of ineffective, induced labor and a continued troubling heart rate, we agreed with my Dr that a C-section was the best route. When I get pregnant again, I’ll be faced with scheduling a 2nd cesarean or trying for a VBAC. With my track record, I simply can’t expect to go into labor spontaneously. If I choose a VBAC, which I hope to unless there is a good medical reason not to, it will most likely have to be aided by medically indicated induction. Our first born was an emergency C-sect 21 months before, due to pre-eclampsia on g. week #34. My wife (35) preferred a VBAC for baby #2 (also a girl) due 01/2016. -we should have studied which hospital/doctor would enable the VBAC the most flexible way – not at any cost, but to a reasonable extent. We were lucky to have the best doctor around on his schedule that time. We could have arranged a doctor if we wished to do so but only before g.week #20. -infusion and constant baby hr monitoring was used all time, no foods/drinks allowed. -after delivery,a touch-in check of the scar (previously measured by ultra sound as 5mm thick) – was performed in a short narcosis,so breastfeeding was almost instantly allowed afterwards.S car was found intact. sorry, this will be a VBAC attempt for me. I have had one vaginal birth after induction (2005) and one spontaneous labor that ended in a c-section due to my inability to push out a posterior baby (2008). I have a question. I am 37 weeks with a breech baby (has been breech since 32 weeks). Yesterday I had an external version by a maternal fetal medicine MD. I scheduled this myself as my office doesn’t do them. The baby turned, but then turned back breech shortly after I left the hospital. The MD had said if they had to try the version again, that they could induce labor immediately afterwards. My first thought was that this would be difficult for me. My office that I have been seeing for my whole pregnancy just wants to do a scheduled c-section on December 10th. My due date is December 14th. It seems as if I switch my care to the provider that did the version, I may have more options. I honestly don’t know what to do though. Is is safe to be induced after a version for a baby that has been persistently breech? Should I just stick with the plan and get the c-section at 39 weeks? Should I just wait and see what happens? I mean baby could turn by himself and I could go into spontaneous labor. Of course this is what I want, but what if it hasn’t happened yet by December 9th. I really don’t want the section. I have posted your question on my Facebook profile (http://www.facebook.com/vbacfacts) and fan page (http://www.facebook.com/pages/wwwVBACFACTScom/44134673920). I personally would try the gentle induction as I have described above. Another alternative is to find a breech supportive provider, but they are few and far between. Thankfully, a low-dose Pitocin and/or foley catheter induction “remains an option” in women planning a VBAC according to ACOG. I would very much like to have this as a last-resort option as I am overdue, but my OB does not want to use petocin to induce at all, even in small doses with a foley catheter (leaving me with no options other than spontaneous labor or scheduled c-section). I would very much like to find where this procedure and risks are mentioned by the ACOG so that I can try to start a discussion of using this option with my OB. Thank you!! Some OBs don’t like to induce, others are ok with it. ACOG says it “remains an option.” Unfortunately, when OBs do not wish to induce, moms are left with no choice. It’s doubtful that showing her ACOG’s guidelines will make an impact on her, but it’s always worth a try. You can chat with VBAC supportive OBs over on the VBAC Facts Community. I would love to know what Stephanie ended up doing. I am in the same exact situation and tomorrow I will be 6 days late and have an appt. for an internal. im not sure where it will go from there but I do know that I will be getting a non stress test on the baby and an u/s (probably the next day) My Dr keeps saying there was no point in checking me bc they cant induce and I need to go naturally, but now shes saying I really shouldnt wait past 41 weeks (according to them is Tues (2days away) according to me who knows my exact conception was 2 days ago. Anyways she says that ultimately I am the boss but she keeps bringing up a c-section even tho I have expressed how much I dont want one especially having a 21 month old to care for too. I will be bringing up the low dose pitocin approach. I have also read somewhere ese that some Dr’s are more comfortable with that if you have started dilating to help kick start labor. So we shall see. Hopefully Stephanie will see your comment and respond. I’m so sorry you are in this situation. It’s certainly not ideal. I posted your question here to get more feedback. I’m not so sure I trust that Mayo Clinic quote since it put abruption in the VBAC catagory when as Raeann point out it should be a c-section, and they put Low aminiotic fluid and slower growth in the time to do something catagory when it really should be time to watch and wait. And then the fact that pre-eclampsia was not specifically mentioned and high blood pressure and diabetis are lumped into the last bullet which should have been near the top. I would expect them to put the most dangerous thing first and the least studied last. Barring that I would expect the most often first. I don’t think they did either. Someone really should come up with a list of reasons to induce before 40 weeks and reasons to induce after 40 weeks, after 41 or after 42. Under the heading “Medical Reasons for Induction” I was surprised to find placental abruption. Those are typically resolved only by C-Section rather than induction. Abruption typically causes severe fetal distress and/or fetal death, not to mention internal maternal hemmorhage. It’s an emergency C-Section situation. Not all abruptions are complete. A partial abruption can still be born vaginally as long as baby is okay. Thanks for the article. My 2nd VBAC was augmented using a foley bulb and pitocin. I was overdue and had Gestational Diabetes, but was thankful that my doctor and the hospital gave me that option.